What is the Excel ISNUMBER Function? The Excel ISNUMBER function is categorized under Information functionsFunctionsList of the most important Excel functions for financial analysts. This cheat sheet covers 100s of functions that are critical to know as an Excel analyst. The function checks if a cell in Excel contains a number or not. It will return a TRUE if the value is a number and if not, a FALSE value. For example, if the given value is a text, date, or time, it will return a FALSE. As a financial analystFinancial Analyst Job DescriptionSee a real Financial Analyst Job Description including all the skills, experience, and education required to be the successful candidate for the job. Perform financial forecasting, reporting, and operational metrics tracking, analyze financial data, create financial models, when dealing with large amounts of data, ISNUMBER Excel function helps in testing if a given result of a formula is a number or not. The ISNUMBER Excel function will return a logical value, which is TRUE or FALSE. How to use the ISNUMBER Excel Function? 1 =ISNUMBER(1) TRUE The value provided is a number, so the function returned TRUE. TEXT =ISNUMBER(TEXT) FALSE The function returns FALSE for text values. 10/20 =ISNUMBER(10/20) TRUE The formula will return a number, so the function returned TRUE. #NAME? =ISNUMBER(#NAME?) FALSE The function returned FALSE for formula errors. =ISNUMBER( ) FALSE The result is FALSE, as it is not a number. Now, select Data validation and click on Settings. As shown below, enter the formula =ISNUMBER(FIND(“XY”,C4)). 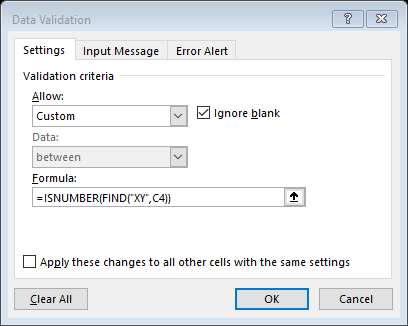 To activate the formula cell, you need to choose Validation criteria – Allow – Custom. When someone tries to change XY into something else, data validation rules are triggered, particularly when a user adds or changes a cell value. The FIND function is shaped to search for the text “XY” in cell C4. If found, FIND will return a numeric position (i.e., 2, 4, 5, etc.) for the starting point of the text in the cell. If the text is not found, FIND will return an error. For C4, FIND will return 5, since “XY” starts at character 5. The result from using the FIND function above is then evaluated by the ISNUMBER Excel function. For any numeric result returned by FIND, ISNUMBER will return TRUE and validation will succeed. When text is not found, FIND will return an error, ISNUMBER will return FALSE, and the input will fail validation. The function is part of the IS functions that return the logical values TRUE or FALSE. The function doesn’t return any error such as #NAME!, #N/A!, etc., as it just evaluates data.